What are you doing to own your faults? What are you doing to fix them? 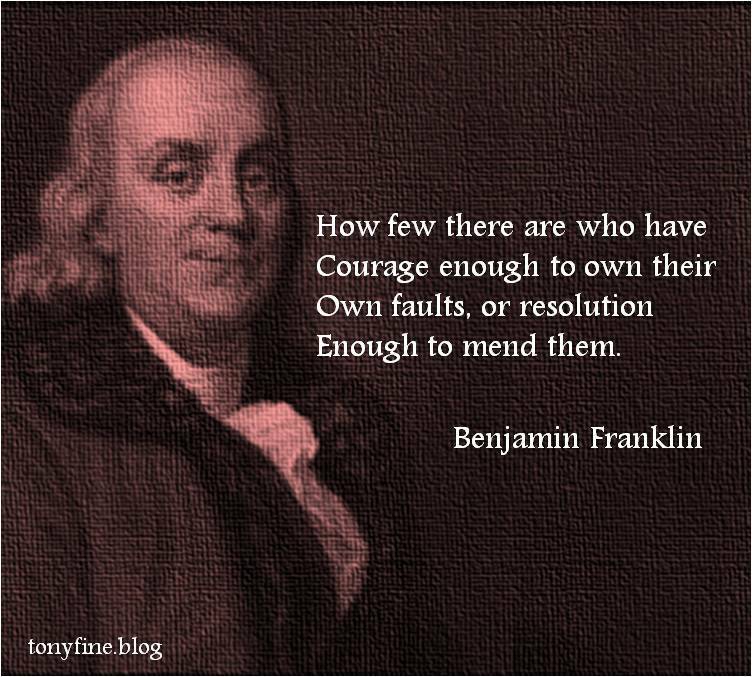 Benjamin Franklin says there are few that have the courage to do this. How true this is, but what if there was a simple daily habit that would assist you with this courageous feat? When I left the Army, I knew writing was going to play a large part in my future. I imagined being a novelist. I thought I had these great ideas, but the act of getting those ideas onto paper turned out to be more difficult than I had imagined. Not only was I struggling with writing, I was also struggling with my transition to civilian life. It turns out that my life and my writing were very similar. I drifted along aimlessly in a murky fog. In the last few years, my journaling has become a regular practice, both in good times and in bad. In order to advance in my practice, I have incorporated some practical tips from Tim Ferriss, Jim Rohn, and even from some ancient Stoic Philosophers. So what tip am I working on now? It comes from one of Seneca’s daily habits. Seneca would take time at the end of each day and examine what he had done and said. In my personal quest to live a more virtuous life, this idea of examining my day seems to be the most beneficial. Doing so gives me the opportunity to look at and address areas needing improvement. Did I make the most of the day? Did I live up to my own expectations in doing what is right? Did I practice the things I love to preach? Using a journal as a daily habit to identify and fix your faults doesn’t seem courageous. But the practice will make you more aware of your day-to-day activities. When you stray from the path, you might be quicker to correct your course and get back on. When you err, you will have the courage to own it and correct it.